"We deserve to be forgotten." — Abject Testament responds to 343 Guilty Spark's concerns about the loss of Forerunner historical data. 03-049 Abject Testament was a Forerunner-created ancilla designated as the monitor of Installation 03. The nomenclature describing him denotes his position as it relates to the third ring and his name was meant to represent both an omen and an epitaph for Forerunner civilization. Tens of thousands of years prior to Installation 03's discovery by humans in the twenty-sixth century, Testament stopped directing the functions of the ring. Near the very end of the Forerunners' war against the Flood, 049 Abject Testament was commissioned alongside six others in order to oversee the Neoteric Halo Array, with Installation 03 in particular being placed in his charge. Right before the Halo rings were dispersed from Installation 00 in its place beyond the rim of the Milky Way, all seven monitors convened aboard a vessel known as the Lifeworkers' crèche. There, they were certified as being fit for their duties, the first of which would be the preparation of activation indexes, distributed to each, for each installation. The IsoDidact and a handful of Lifeworkers gathered with Abject Testament and the six others within the ship's command center before the final dispersement of the Array. The monitor of Installation 04, 343 Guilty Spark commented to Abject Testament on the current inability to access the Domain and the potential loss of Forerunner history. At this, Abject Testament simply remarked "We deserve to be forgotten". Thereafter, Testament was relocated to Installation 03 within the galaxy's Scutum-Centaurus Arm. 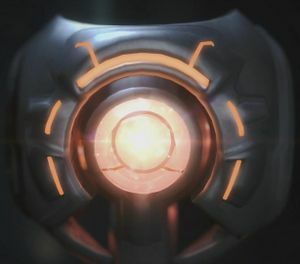 Following the firing of the Array, Testament eventually ceased directing Installation 03's functions. By the time twenty-sixth century humans discovered the ring in the Khaphrae system, tens of thousands of reports had been filed by the Halo's sub-monitors detailing the poor state of quarantine controls and lack of action on outstanding maintenance and research requests. These reports dated back at least twenty thousand years. On July 25, 2557, the monitor of the Builder world Clinquant, 859 Static Carillon, noticed a service portal between his installation and Gamma Halo had been reactivated. Carillon made several attempts to contact Abject Testament about the reactivation but received no responses. In one of Halo: Combat Evolved Anniversary's terminals, 049 Abject Testament was voiced by Fred Tatasciore, who also voiced the A.I. aboard the Truth and Reconciliation in those terminals, various Jiralhanae in Halo 3, and some minor roles in Halo 4. 049 Abject Testament and 343 Guilty Spark converse.